I was skeptical. Two cubes sat side-by-side, looking like stripped-down 3D printers. I sat in front of one as instructed, and reached my hand inside, toward a floating disembodied finger. Just at the moment I knew I’d stab through the illusion, I had the ultimate “E.T. phone home” moment—I swear I could feel the other finger pressing on mine. This was the magic and wonderment of HaptoClone, the creation of Shinoda Lab at the University of Tokyo. I tried it out at SIGGRAPH this week and even after donning dozens of VR goggles and gawking at hundreds of CGI renderings, this simple haptic device was the most interesting thing I experienced. HaptoClone works by using converged ultrasound to give tactile feedback. An array of 1992 ultrasonic transducers are installed along the inside of the cube, which record and replicate omni-directional and volumetric forces. 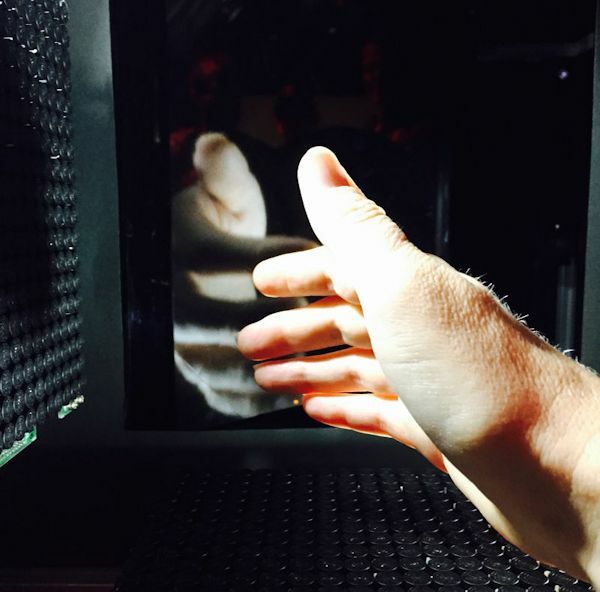 The feedback is instantaneous, so you can get a quite realistic feeling that the hand in the other cube is touching yours. But to make the illusion more complete, they’ve added a trick with a mirror which helps you think you see the object you’re touching (it’s the same trick that made the Tupac “hologram” which is known to haunted house enthusiasts as Pepper’s ghost). The combination of the ultrasound nudges plus the visual cues superimposed before you definitely makes for a magical “telehaptic” moment. After reaching out and touching my cube-mate, we did a kind of a modified handshake and high-fived. The forcefield wasn’t as strong as in reality—it didn’t stop my hand in mid-air completely as a human hand would—but it provided enough detail that I could easily feel each of his fingers as they were touching mine. But the next part was even crazier. A tiny beach ball tethered with a wire was placed into the cube and I was told to swat at it. While I couldn’t feel anything as detailed as textures, I gotta say it felt completely convincing, especially the part where I could manipulate the ball. I could tell just by touch and tactile feedback that it was some kind of inflated plastic for sure. As far as a practical application, HaptoClone isn’t quite there yet. Right now these cubes are big and bulky. Plus the physical detail isn’t good enough to share specific tactile information; it’s more about giving a general idea that you’re interacting with a real object or person. But the feeling that you’re bumping up against an optical illusion is pretty convincing—at the very least, you could make a way scarier haunted house. But it’s not too hard to imagine what’s coming. I have an eight-month-old and we regularly FaceTime with the grandparents. My daughter’s first reaction is to lunge out at the iPad, attempting to touch the face of who’s talking to her, just like in real life. Consider a 3D version of Force Touch, the pressure-sensitive interface of an Apple Watch, that would allow my parents to feel their grandchild’s palm on their cheeks. I could easily see how this could soon be the next generation of enhanced video chat. You know, when you actually want to reach out and touch someone.